Get the <a href=”http://www.widgetbox.com/widget/mp3″ mce_href=”http://www.widgetbox.com/widget/mp3″>Google Audio Widget</a> widget and many other <a href=”http://www.widgetbox.com/” mce_href=”http://www.widgetbox.com/”>great free widgets</a> at <a href=”http://www.widgetbox.com” mce_href=”http://www.widgetbox.com”>Widgetbox</a>! Sally Melville has been on the knitting scene for years, demystify the craft for all the rookies and self-taught knitters she cheerfully coaxes along at her workshops. Tune in to this episode of CraftSanity to find out how Sally became a knitwear designer and author years after she discovered the wonderful world of knitting as a 7-year-old Brownie. “It just felt like what my hands were meant to do,” she said about her first foray into knitting. “I was really good at it right from the first day. 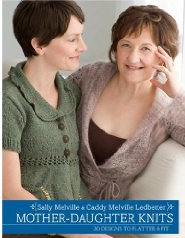 Sally recently co-wrote a knitting book with her daughter Caddy Melville Ledbetter, called “Mother-Daughter Knits: 30 Designs to Flatter & Fit,” which I highly recommend. Melville, 59, of Ottawa, Ontario, has published five books since 1998 and will be in West Michigan Sept 14 and 15 to teach workshops hosted by the Threadbender Yarn shop. (You can read the column I wrote based on this podcast interview on my newspaper blog. Whether you knit or not, there’s something for everyone on this episode that touches on the creative process and knitting through grief. So grab your latest project and settle in to enjoy Sally’s story. Whimsically hand-drawn patterns and vibrant colors define Liz Scott’s playful collection of original fabrics offered at her online Etsy shop WonderFluff. Get to know Liz and see more of her fabric designs at LizScott.com. Allison Rosen hosts the Within a Quarter Inch podcast about quilting and sells digital collage sheets she creates using found images. Mention CraftSanity if you buy something from her Etsy shop, Harmonica Goldfish, and she will throw in a free collage sheet. Buy a CraftSanity T-shirt or button or sponsor an episode. Also, check out my etsy shop to see my handmade line of wooden peg looms.